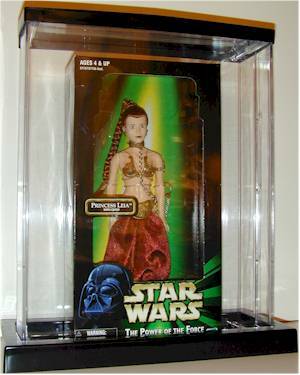 There's a variety of display cases available for the action figure collector today. Most of these are designed for the larger figures, from 8" to 12", but could be used for smaller figures in some cases as well. Here are four of the currently available models, with my two cents on each one. Some of this will be familiar to those that read my other web site, but I thought it would be useful to put the info on several cases in a single place. 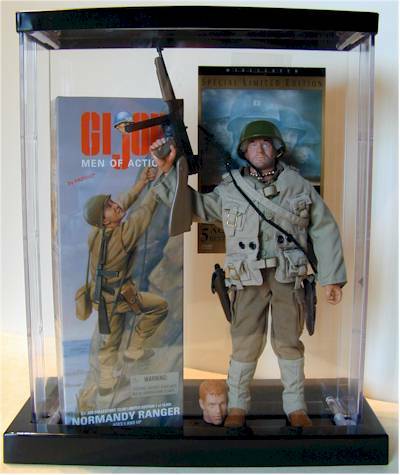 Ballqube (www.ballqube.com) makes a wide variety of plexiglass cases for different collectibles. They also provide wooden bases for these cases at an additional cost. Their standard figure case works quite well for a single 8" or 9" figure - a 10" one might fit, but he'd be crowded, and there's no room for a 12" figures. Exact dimensions are 5.20" x 3.90" x 10.45". You can see to the right that a Famous Cover figure fits nicely. 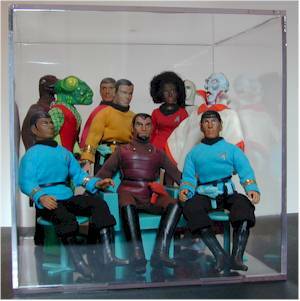 To the right you'll see this holder containing a bundle of Star Trek Megos. I've also seen this case used to set up the Flatt World Bela Lugosi with his coffin and extras. If you're looking to set up a scene, but still want the protection from dust, these larger models will do the trick. This one costs $25.83 for one, $23.08 each for 2 or 3, and for 4 or more they drop to $20.70 each. Nice protection, and an attractive look. The price is a little high, and probably prohibitive for lots of figures, but for the special ones you want dust free, these are an excellent way to go. 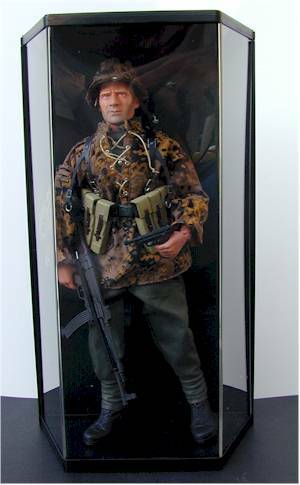 Dragon Models (www.dragon-models.com) have just started providing a nice display case designed specifically for their 12" military and police figures. Here you can see Alfred inside the case. The black background is nice, allowing you to have a good contrast against which you can easily see the figure. I think I prefer this to the all clear cases. The front of the case is angled, so you can easily see the figure from all three sides. These cases run around $12 at most Dragon retailers. One of the more interesting features is the inclusion of two round brackets of different sizes. These can slip around the waist of pretty much any size 12" figure, and they attach through the back of the case. This will hold the figure steady, which would be far more important for some of the figures that are feet-impaired like Barbies. I'd have given this one a better score except for two details. First, the price is a bit high - perhaps 8 bucks or so would be far more reasonable. And second, the case needs slightly more depth. As you can see in the picture, poor Alfred can't even point his Luger out straight. Ouch. 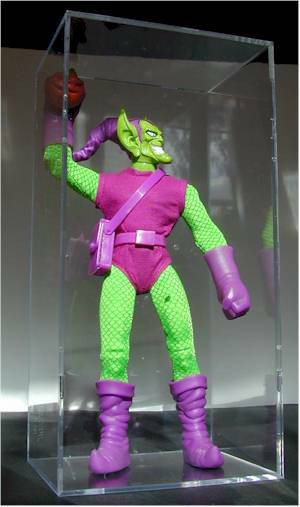 KB Toys (www.kbkids.com) has a very nice 12" case currently available both on line and at their stores. Called the Collector's Doll Showcase, it retails for about $10. They are designed to hold Barbie style dolls, including the box. They are 11.75" wide, 15" tall, and 4" deep. They come with a black plastic base and top and plexiglass sides. The picture to the right demonstrates that they can hold the average Star Wars boxed 12" figure just fine, although they are too small for the extra deep boxes. They are also too small to hold two loose 12" figures comfortably, but they can hold two 9" figures nicely. The extra space in height can allow you to place some sort of interesting background picture on the back of the case, clearly visible behind the figures. 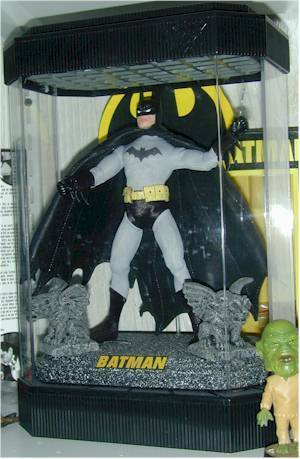 This case is large enough to allow you to add some extras with the average loose 12" figure. The construction is extremely sturdy, and the design is attractive. And the best part - these are on sale right now at Kaybee Toys for $9.99 each. A very good deal! Mcfarlane Toys (www.mcfarlane.com) also makes slightly smaller lighted cases that are extremely useful for their figures, as well as others in the 7"-9" range. I've bought several of these, and use them mostly for 8" figures. The case construction is quite sturdy, and they are very attractive. However, don't bank on the light-up feature too much. The bulbs tend to burn out very fast, and you'll find yourself replacing them quite often. Price point on these is around ten bucks, but it depends on where you pick them up. I suggest trying to get them from McFarlane toys directly at a toy show, as they tend to have a pretty good price there. Also, some Mcfarlane figures come already in these cases, and at times (i.e. sales) can be had cheaper than the individual cases themselves. If the light up feature functioned better, these would certainly rank up there with the others. The construction is excellent, and they look great on the shelf. However, their size also hurts them, as they won't work for the average 1/6th scale collector. Another shot of the Collector's Doll Showcase holding a 12" Tom Hanks kit bash figure.